First Line: "This is the part where I die." Review: I've heard a lot about Sarah Ockler books so I decided to take the plunge and finally read one and I am going to be honest, I didn't love it, but I did like it. My enjoyment of the book definitely stemmed from her writing which I found beautiful and I just wanted to keep reading, she made everyday actions sound beautiful. Elyse was a bit of a mystery. We know she lost her voice and that she fled her home in Tobago leaving all her family behind, but we didn't know why and what exactly happened besides it having to do something with her twin. I liked Elyse for the most part, she felt real, the way someone would act if they had gone through what she did. She was angry with her situation while learning how to deal with her new life of not being able to speak or sing, there is the case of her feeling sorry for herself a lot so that kind of bugged me about her but still it was realistic it was just a bit of a downer. Then there was the fact that everyone treated her like a broken doll, well everyone except Christian. The romance between Christian and Elyse was cute and sweet, but I wasn't really feeling it. Christian didn't really interest me much or make me swoon in any way. Yet at the same time he was what Elyse needed so I had nothing against the two of them getting together. I did like the relationship Elyse developed with Christians little brother apparently his little brother likes girly things including wanting to be a mermaid for a parade so you have that issue tackled in the story since the town they live in people are a bit close minded. I loved Elyse for sticking up for him and being able to put her pity party on hold to help Sebastian out, that kid was seriously awesome I hated everyone who was against him being happy, which also leads me to Christian and I have to say even though as a love interest he was a little blah for my likes he was an amazing brother. Even though I liked the book, I just didn't feel a real connection with it or the characters. Like I said earlier I liked Elyse but I didn't really care about her, I easily was able to put the book down and not have the urge to hurry up and pick it back up to see what happens next. Honestly, the only person I cared about was Sebastian but, unfortunately, the book wasn't in his point of view. 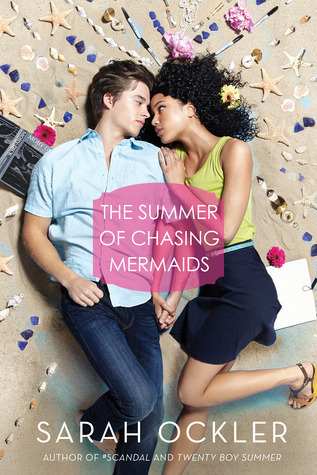 Overall The Summer of Chasing Mermaids was written very well with its poetic prose but I did find it slow at times. One thing I forgot to mention was I did appreciate the diversity, we definitely are in need of more diverse characters in books nowadays. ~"I was in love, just like in the stories. But unlike those fairy-tale girls, love didn't save me; it changed me." ~"You make me think things are possible. You make me want things."